It's not the destination... it's the journey. Starting work on my Las Vegas crime novel, “Joey’s Place,” and its planned prequels, I knew that tracking and utilizing the research necessary would be a challenge. I started looking for research software. One I found was Personal Brain. Having three hundred years of known facts about southern Nevada and the southwest as well as the biographies and character sketches of many individuals (great and not-so-great) readily available and easy to access was a necessity. Then there was the geological and pre-historic information that I would need to give my stories veracity. And I wanted to be able to link or relate elements of my research quickly, easily, and flexibly. Keeping track of my own notes and research had always been a challenge (but never to the extent of my writing partner’s non-system). Then I discovered “Personal Brain” software. After testing its demo version, I realized that this was software that could keep my work organized and still allow me the flexibility I needed for basic brainstorming. 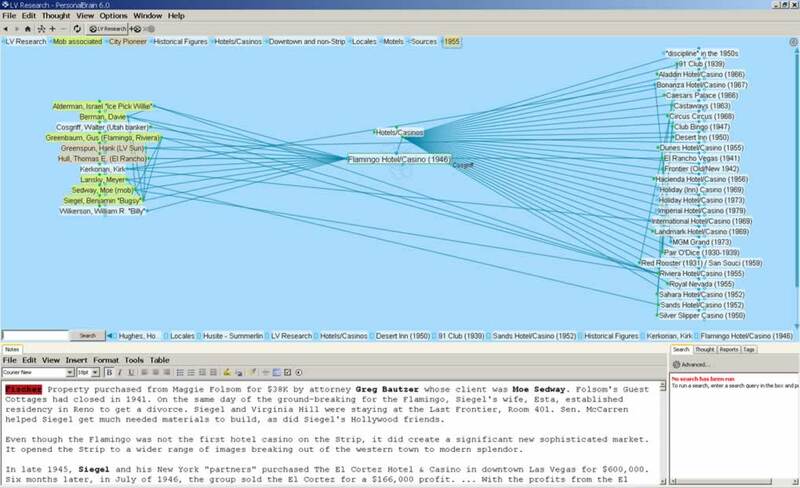 For example, in the image at right, you can see the connections I created from and to the Flamingo Hotel/Casino. In the text box are the various facts I gathered about the resort — its origins, dates, events, etc. — from a variety of sources, online and in books or magazines. This thought is a “child” of a parent thought called “Hotels/Casinos” and, on the right of the Personal Brain screen, you can see all the other thoughts linked to this parent. On the left of the screen are “jump” thoughts to individuals (in this case) who had some type of connection to the Flamingo. Note how these individuals can also be linked via “jumps” to the other establishments (on right of screen) with which they were associated. 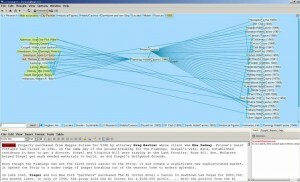 You can also see how the establishments themselves can be associated with “jump” links. It’s just as easy to remove the links if you want or need to. Expanding and decreasing the size of the text displayed in the thoughts area, or “Plex,” is as simple as click ‘n’ drag. Across the top of the screen are “thoughts” (mostly parent thoughts), that I have “pinned” for quick and easy access. Across the bottom is a history of the thoughts that I have most recently accessed. New thoughts arise from old thoughts, old thoughts and links are revised and altered as new ideas occur. Just as important, research information is readily available for review with full text formatting to indicate what has been used, what might be used, or what is still needed. If you are looking for a powerful research and brainstorming tool, you might want to consider Personal Brain. Tagged Historical Fiction, JOEY'S PLACE, Las Vegas. Bookmark the permalink. Please subscribe to my newsletter mailing list.